Some materials can generate a small voltage when bent and, conversely, can bend in response to a voltage. This phenomenon is called flexoelectricity, and until now, it was thought that the effect only existed in electrical insulators (materials that do not conduct electricity). 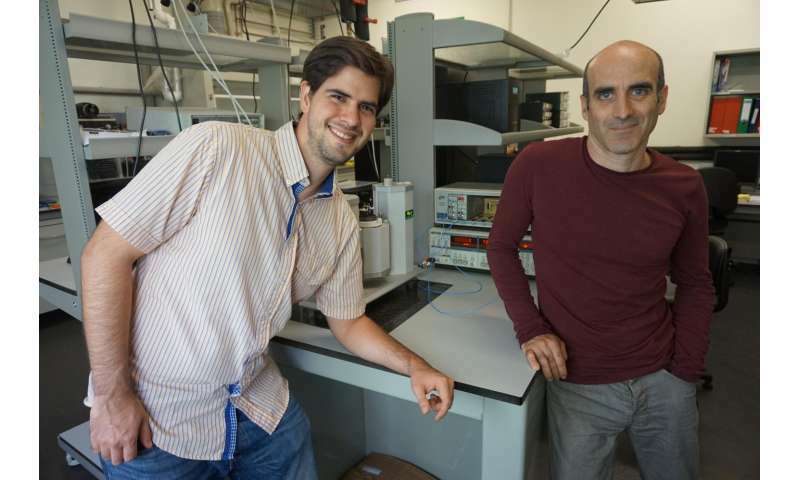 However, a research team from the Institut Català de Nanociència i Nanotecnologia (ICN2) in Barcelona reports today in an article in Nature that flexoelectric-like effects are more ubiquitous than previously thought. The ICN2 researchers report that semiconductors, which can be thought of as halfway between electrical insulators and actual metals, also generate electricity in response to bending. This is important because semiconductors are a common family of materials commonly used in transistors (the heart of integrated circuits) and photo-voltaic cells. The new results show that it is possible in principle to use them as pressure sensors and electrical micro-generators. The authors of the study are Dr Jackeline Narvaez, PhD student Fabián Vásquez-Sancho, and the ICREA Research Professor Gustau Catalan. Flexoelectricity happens as a consequence of any asymmetry in the deformation of a material. Bending a material forces the atoms closer together inside of the bend, and farther apart on the outside. This redistribution of the atoms forces the redistribution of their electrical charges, which can be exploited to establish an electrical current between the inside and the outside of the bend. Until now, it was known that all electrical insulators can be flexoelectric. The surprising discovery by the ICN2 scientists is that semiconductors can also be flexoelectric –and in fact, they can generate more charge than insulators. The key ingredient of this new bending-induced electricity is in the surface of the materials. The Nature article, published online today, describes how crystals of an initially insulating material are able to generate 1000 times more bending electricity when they are doped to become semiconductors. The reason is that, although the insides of these crystals do become conducting as a result of doping, the surfaces remain insulating. This means that the surfaces not only can still polarize, but in addition, they receive a boost of extra charge from the semiconducting interior. Because the electromechanical response in semiconductors is dominated by the surface rather than the bulk, the authors call this effect "flexoelectric-like." The response is identical to flexoelectricity from a practical point of view—it is an electrical current generated in response to bending—but different from the fundamental point of view of its origin. It is also noteworthy that measuring the flexoelectric response of the surface is an important scientific milestone in its own right. In all previous measurements, which were performed in insulators instead of semiconductors, the surface signal was always mixed with the bulk signal coming from the interior of the crystal. This is the first time that the response of the surface has been measured separately. Traditional flexoelectricity (i.e. the flexoelectricity of insulators) is important at the nanoscale. Until now, however, it was not practical at the macroscale. Instead, the dominant effect at the macroscale was piezoelectricity, whereby some materials generate electricity in response to compression, rather than to bending. The reason is that materials are much harder to bend when they are thick (macroscale) than when they are thin (nanoscale), which is intuitive—just think how much harder it is to bend a 1000-page book compared to bending a sheet of paper. However, the flexoelectric-like response of semiconductors has an important feature: It increases with the thickness of the material. Thus, the loss of flexibility is compensated by the increase of flexoelectricity, and this allows a competitive output independently of the device thickness. Crucially, this flexoelectric-like response can in principle be present in any semiconducting material, whereas piezoelectricity is only possible in a limited number of materials, the best of which are lead-based and therefore toxic. The authors are so convinced of the potential usefulness of their discovery that they have filed a patent and are currently seeking industrial partners to develop technological applications of semiconductor flexoelectricity.